The following was sponsored by CreditRepair.com. All opinions are my own. As I sat across the desk from my home mortgage officer, I can remember feeling overwhelmed. I knew the general idea behind what taking out a home loan to purchase my first house meant. But, I didn’t know that just a few months later I would be so stressed about money that I would be unable to sleep through the night. This is what prompted me to start this blog, and to later quit my job to become self-employed. While I’m thankful for all of these things now, at the time I just felt overwhelmed. Related Post: 7 Simple Steps to Start a Blog in Minutes! I don’t remember my exact score. But, it was somewhere are around 650-ish. Although I knew credit scores were important for obtaining a home loan, I hadn’t been worried about checking mine. I’d never been denied a request for credit before. I already had a few credit cards and a student loan. I thought I had good credit, but I was wrong according to www.is650agoodcreditscore.com. I’m sure we’ve all heard that having good credit is important for things like getting a home loan, car loan, or credit card. But, did you know that it’s important for other things too? Your credit history can be used to determine your ability to rent an apartment or get a job. While employers won’t be able to see your exact credit score, they can view a special credit report to see if you have any late payments or other signs of irresponsibility. They are essentially reviewing your credit history to decide if you’d be an asset or a liability to their company before hiring you. This is just another reason why it’s important for you to monitor your own credit history to make sure it’s accurate. You can get a free credit history at AnnualCreditReport.com from each of the three credit reporting agencies once per year. Since you can get three reports each year (one from each agency), the smart thing to do is to pull one every four months to keep an eye on things throughout the year. However, these reports won’t give you your credit score without you paying for it. Luckily, there are other options you can use to get your credit score without paying. You can get a free FICO credit score from Discover Credit Scorecard, even if you’re not a Discover Bank customer. Or, you can use a free service, like Credit Sesame to keep track of your score over time. The score on Credit Sesame is not quite the same as your actual FICO as it’s an estimated score prepared by Credit Sesame instead of one of the three credit reporting agencies. But, I’ve found that it’s pretty accurate when I’ve compared my Credit Sesame score to my FICO score. To be honest, improving my credit score was more of a by-product of practicing good financial habits than something I was actually focused on doing. 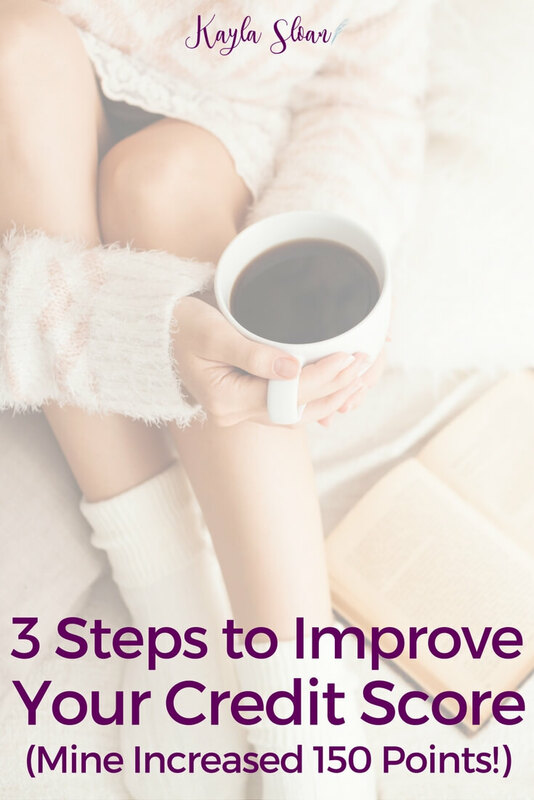 A lot of improving your credit score is about these simple habits, like paying your bills on time. You can also improve your score by paying down your debt to lower your credit utilization ratio. 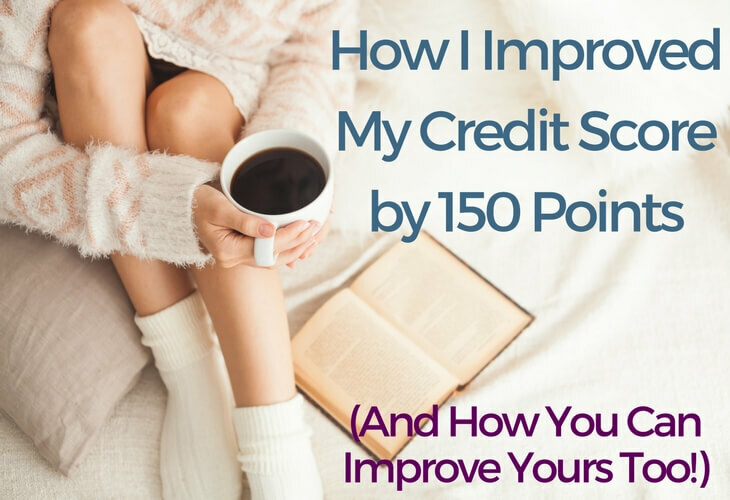 To improve my score, I simply worked to pay off debt, and avoided opening or closing lines of credit. Every time you open a new credit account, your score will be dinged by a few points, plus your average account age will be lowered because of the new account. Closing an old account without a balance can also harm your credit. It can lower the amount of available credit, increasing your credit utilization ratio, and again it can also cause your average account age to be lowered if you close one of your oldest accounts. These types of actions will help your raise your score on your own, but it will take some time. Be patient while your score improves naturally from your good financial habits. While it was pretty easy for me, that’s not the case for everyone. Some people have massive errors on their credit reports. They may be unable to raise their scores because of these mistakes. When you pull your credit report from AnnualCreditReport.com, you can report mistakes yourself on their website. However, most people either fail to do this or forget to follow up to see if these mistakes were actually removed from their credit report. I get it! We’re all busy and it’s difficult to keep up with your credit report and all the other things in life. This is why companies like CreditRepair.com can help. CreditRepair.com can work with you to improve your credit score with three simple steps: Check, Challenge, Change. Truthfully, these are all things you can do yourself. But, by hiring a company to do it for you, you have some peace of mind that it will be taken care of without having to add it to your own to-do list. You’ll still need to be patient. Each error will need to have a separate dispute filed. Plus, it can take 30 to 45 days for each dispute to be resolved. Finding a reputable credit repair company can be a concern too, so make sure you read the fine print before signing up for credit repair services. Any company that makes unrealistic claims about how they can “raise your score by 100 points immediately”, or similar is probably in violation of Federal Trade Commission law. Luckily, CreditRepair.com is one of the good and reliable credit repair companies that can help you improve your score for real! It’s up to you if you decide to DIY or hire a credit repair company to help you improve your score, but either way, it’s clear that having a good credit score is important for so many reasons.